Four Potain Hup 40-30 cranes are in the process of being delivered to a customer in Russia. The cranes are the first Hup models to be delivered in the country. The customer, a crane rental company, chose Potain Hup range because of their high capacity from a small package, height under hook, and versatility. Moscow-based crane rental company TOPKRAN-RENT has purchased four new Potain Hup cranes – the first to be sold in Russia. The well-established contractor has purchased four new Hup 40-30 self-erecting cranes. All four cranes will be put to work on a four-month project in the capital. TOPKRAN-RENT is already familiar with the Potain self-erecting cranes from Manitowoc, having previously purchased several Igo 50 cranes – the biggest model in the Igo range. Like the previous cranes, the Hup range is well-suited to space-restricted job sites, with an added emphasis on providing superior lifting capacity at tall heights, increasing productivity for owners. The state-of-the-art Hup range was launched at bauma in April 2016, following a significant development period. The range was created with total cost of ownership advantages in mind, with increased speed, efficiency and versatility being the focuses of the design. The Hup 32-27 was the prototype of the exclusive new range. It has a maximum capacity of 4 t while being able to lift 1 t at its jib end of 32 m. In September 2016, this was followed by the Hup 40-30, which has a longer jib end of 40 m. The Hup 40-30 features a telescopic mast for a range of working heights. This design boosts the height under hook attainable by the crane to 25.6 m (84 ft) in its “low position,” and 30 m (98 ft) when extended to its greatest height. The logistics are also improved, as no extra mast is required to install the crane. TOPKRAN-RENT is a large-scale rental company in Russia for tower cranes, mobile cranes and crawler cranes. It is well-established in Moscow but covers the entire country. Significant projects include helping to build the Fisht Olympic Stadium in Sochi, as well as the 45,000 capacity New Rubin Kazan Stadium in Kazan. 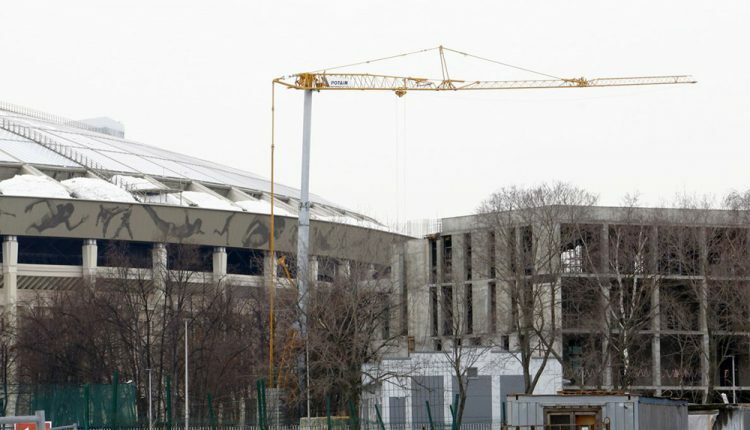 Other projects include the construction of the CSKA stadium, the renovation of the Luzhniki stadium, as well as development of the Moscow metro.